Highly adaptable and versatile access solutions that can deliver a cost effective solution and can also help overcome challenging architectural features. Self-powered building access units, both semi-automatic trollies and fully automatic roof cars, offer a highly adaptable and versatile option which can deliver a cost effective solution and can also help overcome challenging architectural features in more complex projects. In many instances, there is limited roof space available for a permanent, roof-mounted BMU. This might be due to the design of the building itself or because roof space is required to accommodate other uses such as a sky-garden, elevator equipment or solar panels. The versatility of self-powered building access units can provide the answer to these issues. Perhaps the key defining feature of the semi-automatic trolley is that it allows the hoist to be located within the cradle of the Building Maintenance Unit itself, rather than being housed in a separate roof-mounted unit. Beyond saving precious roof space in itself, this provides additional functionality of making the cradle interchangeable between various roof rigging systems. Semi-automatic trolleys are often deployed as an economical solution where, for instance, they can be moved and used across a number of adjacent roofs with varying levels. The fully automatic roof car utilises a trolley and cradle which is designed to traverse to the area of the facade where it is required. This portability means it is commonly combined with a relatively short jib arm which can often provide all the required coverage from a compact unit which is inconspicuous in its parked position. Both the semi-automatic trolley and the fully automatic roof-car can be combined with a horizontal track on the roof, a vertical track on the roof parapet or on a concrete track in order to minimise the roof space they take up in the specific orientation which best suits the particular building concerned. 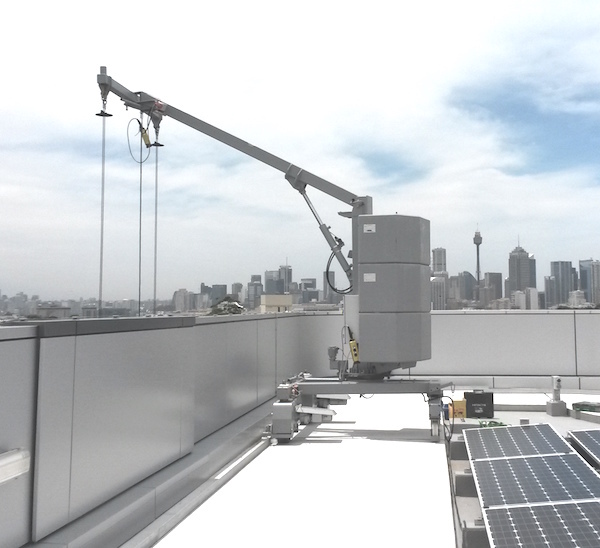 Moving the BMU off the roof entirely, self-powered cradles can also be suspended from a monorail or from davits, adding to their adaptability for a number of architectural challenges. Depending on the challenges presented by the building, a monorail track can be configured to run horizontally, vertically or on an inclined surface. A monorail can be a particularly desirable and flexible solution where the technical and aesthetic challenges of the building go beyond what is achievable with standard facade access systems. For instance where the design of the building requires the machines and track to be hidden or integrated seamlessly with the facade. Although they are often thought of as an economical solution for buildings of lower complexity, the adaptability, versatility and compact size of both the semi-automatic trolley and the fully automatic roof-car can also make them the most appropriate option for some sections of more complex buildings. Contact us to find out how our comprehensive range of facade access solutions can be tailored to meet your particular access needs.